Getting to Number One on Google is a dream for most website owners. Yet, millions of people are busy striving to get to the top of the list. Why? Because it matters. Almost all of the clicks on a search results page go to the top three, with the majority of those clicks going to the “number one” slot. Some people do click on websites lower down the list and a few go to subsequent pages. But most of the “action” is for that “Top 10”. If you are not on that front page, you get fewer clicks. This is all obvious search engine marketing stuff, I agree. However, do you dream of being on other “Top 10” lists? Are on on the Top 10 Websites in Your Sector? Are you on some guru’s top 10 favourite websites? Are you listed in some magazine’s top 10? Getting onto such listings might seem futile, however there is now some new research which shows that being ranked highly on lists like these can impact your business. The study looked at applications for university places in America. It found that universities that were ranked highly in various listings were the ones that received most applications. In other words, consumers were influenced in their decisions by arbitrary rankings. It seems logical that the same happens to websites. After all, the Google search results is an arbitrary ranking; just because Google lists a website at Number One does not mean this is the best website, the most accurate website or the most interesting one. It just means that the website fulfils the arbitrary criteria set by the programmers at Google who compiled the algorithm. They could be wrong in the decisions they have taken as to what constitutes a good result. Yet in spite of the arbitrary nature of Google’s search results, we dutifully rely on them, assuming that Number One is best. The same logic applies to other listings we see. 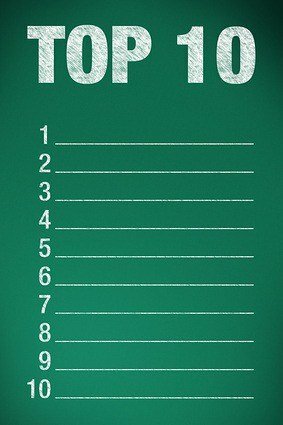 If someone has compiled a list of the “Top 10” of something, we assume they have criteria and have made a judgement and therefore we should take note of it. Their listing, though, could be completely random; even so we are influenced by such listings. That means if your website is not on various listings and rankings then you are having less influence than you might otherwise have. This new research implies that website owners need to get their pages ranked on a range of lists in addition to the ranking on Google. Being ranked highly on Google is good, but it is not the only listing that can have an influence. Time to get your website into some other Top 10s…! The truth is that people love competition and they also like being associated with the best. That’s why you want to be in the top of lists. In the case of Google it’s also because you want to be consider to be the most relevant site for that specific keyword phrase. So people will come to your site and not search any further to your competitors.